Most everyone knows that biodiesel in the winter time can have problems with gelling if used straight or in high biodiesel blends without anti-gel additives. Here at TBI, we use biodiesel in our trucks and cars all year around, and generally don’t blend it with diesel fuel unless we are forced to because of mid-trip refuels or extremely low temperatures. Diesel fuel can gel also, albeit usually at lower temperatures than biodiesel. 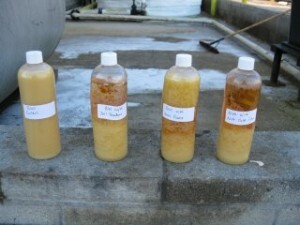 The feedstock, or type of vegetable oil used in production greatly affects the winter performance of biodiesel. The less saturated the fat, the better the performance in winter time. 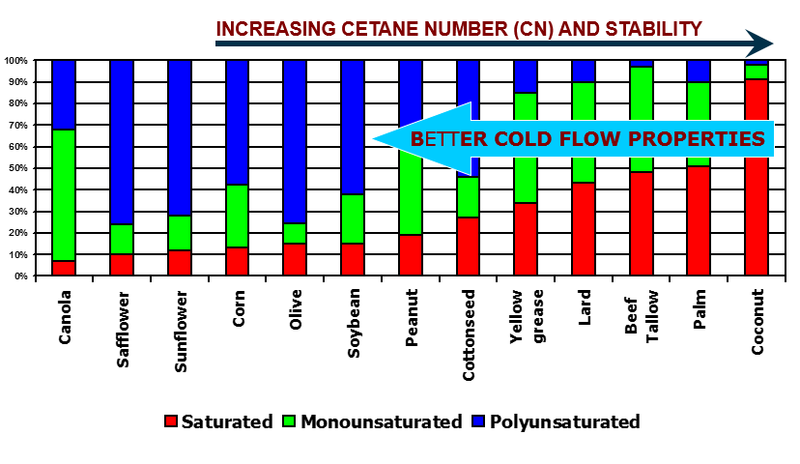 Canola oil works very well for low temperature biodiesel, and palm oil is among the worst for cold weather performance. With North Carolina in the 20’s and 30’s for a few weeks and snow on the ground today, I thought it would be good to repost some information about biodiesel and gelling in the winter time. There are two main measures of the potential for gelling when buying biodiesel, “cloud point” and “cold filter plug point”. The cloud point is the point at which the fuel will begin to form wax like crystals in the fuel which make the fuel appear cloudy, hence the name. These wax like crystals are of course solids, and will cause filters to plug. Long chain methyl esters, especially saturated ones like Palm Oil Biodiesel (PME), can solidify as the fuel temperatures drops. These can plug filters and cause engines to not start or stall shortly after start-up. The cold filter plug point is the temperature in which the fuel will no longer flow and will cause filter clogging. Generally, the vehicle will have combustion issues before this temperature is reached, but certainly once it is reached, fuel will no longer reach the engine, and it will starve for fuel. 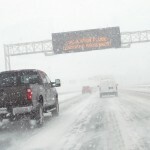 Other things that can also cause winter fuel performance issues are sediment and trash in the fuel, which can exacerbate and raise the cloud point temperature, due to the way the wax crystals form, as the sediment or trash particles in the fuel form a great nuclei for the wax crystals to form. This means clean fuel is very important, especially in the winter time. High moisture in biodiesel can also cause freezing or ice crystal problems in the fuel which can affect cold flow performance. B100 treated with different anti-gel additives at the start of the test. Low was 14F. B100 treated with different anti-gel additives at the end of the test. Low was 14F. The two main ways that biodiesel is usually treated for winter time use is by adding anti-gel additives or blending with petroleum diesel (either #2 Diesel or #1 Diesel). Commercial anti-gel additives can help winter fuel performance by modifying the wax crystal structure during crystal formation when cooling occurs in the fuel (this is true for diesel or biodiesel). For biodiesel, simply adding a commercially available anti-gel additive for regular #2 diesel fuel should be fine. Any truck stop or auto supply store will have several brands to choose from. As long as it’s made for diesel fuel (and NOT gasoline), you will be okay. However, some work better than others for biodiesel. We’ve done some extensive testing with anti-gel additives and chose the best one for our commercial application to all our winter fuel blends. 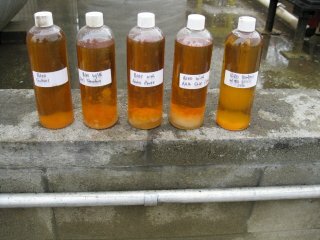 Experiment and see which additive works best for your biodiesel fuel or biodiesel blend. It is important to add the anti-gel before waxing occurs, as it will not perform as well afterwards. So, add the anti-gel at the first sign of cold weather. Biodiesel blends with #2 diesel as high as B80 (80% Biodiesel to 20% #2 Diesel) work well in North Carolina for vehicles that can operate on high biodiesel blends. It helps to have a heated fuel filter as well, but it’s not always necessary. Additionally, these fuels are usually treated with anti-gel additives too. Colder temperatures in northern states might naturally require higher blends of diesel. B20 is a common blend that seems to show few problems with cold weather in all but the coldest states. Minnesota has done extensive testing in severe cold weather operations with B2 blends. #1 Diesel, or Kerosene, has excellent cold flow properties and is quite often blended with #2 Diesel in the winter months to meet cold flow specifications, thus improving cold weather engine operability. Cloud and pour points, and CFPPs of some #1 Diesel fuels can be well below -30º F. So adding #1 Diesel to B99 biodiesel can also have the same effect, lowering the cloud and pour points simply by blending fuels. By using anti-gel additives and/or diesel fuel blends, you can continue to run biodiesel in your car or truck all winter long without fear of being stalled on the side of the road due to cold flow performance problems. As always, be sure your fuel source is reliable and registered, so you know you are getting a good product. In a multi-part series about biodiesel, this is the first of several articles in an attempt to dispel the myths about biodiesel and it’s use in commercial and private diesel engines. While it is true that biodiesel can gel during the winter time, so can regular diesel. The fact that biodiesel gels at a higher temperature than diesel fuel can be mitigated by adding the same anti-gel additives that are already added to regular diesel fuel in the winter time. All diesel fuel, petroleum or bio-based, gets anti-gel additives added to it in climate zones where the potential for gelling can occur. In even colder climates, the fuel may be blended with #1 Diesel (kersosene) in order to reduce that gel point further. There have been many studies showing biodiesel suitable for cold climates. Yellowstone National Park powers about 300 vehicles, boilers and other diesel equipment using biodiesel, at least a B20 blend, all year round. Brooklyn Park, MN has used biodiesel blends since 1999 in its fleet of over 100 vehicles, including fire trucks, utility and police vehicles. Cranmore Mountain Resort, located in North Conway, NH, joined other ski resorts nationwide, such as Aspen, Colo., in fueling its snow grooming fleet with B20. Harvard University has experienced great success with B20 for a number of years. Harvard’s 68 vehicle diesel fleet—which includes snow plows, shuttle buses, solid waste and recycling trucks, landscape services vehicles, tractors and pick-up trucks—relies on biodiesel year-round. For very cold climates, we agree that B20 as the suggested blend to use for trouble free operation. However, there have been some examples of using pure biodiesel in cold climates, but inline fuel heaters were used and are probably not common enough to recommend the general use of higher blends in cold climates. Here in North Carolina, our fleet and personal vehicles run B99 all year around, without heated fuel filters or tank heaters. Granted, we don’t get sub-zero winters here, but with our proprietary cold-soak biodiesel methods and anti-get additives in winter time, we have yet to have a failure, even on really cold February mornings. We did significant testing last winter on our fuels and additives to ensure we would get the cold temperature fuel performance necessary to keep our biodiesel flowing and our customers rolling. Furthermore, biodiesel is quite commonly used as home heating oil (as in our case for our furnace at our production facility). Often mixed with diesel fuel, called Bioheat, this mixture is commonplace in the NorthEast for home heating oil. We don’t typically sell much Bioheat, as heating oil has been largely replaced by natural gas in the eastern North Carolina counties.